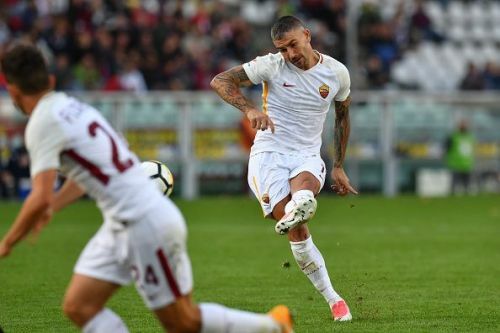 There's no doubting AS Roma’s astute capture of Aleksandar Kolarov in the summer has been one of the signings of the season. Blessed with tremendous technical qualities, physicality, intelligence and vast experience at the top level, his presence has been crucial towards his team's positive campaign so far, which was highlighted by the Giallorossi topping their incredibly tough UEFA Champions League group that also contained Chelsea and Atletico Madrid. The fact Roma have purposefully channelled a large portion of their attacks down his side has been a testament to his quality. 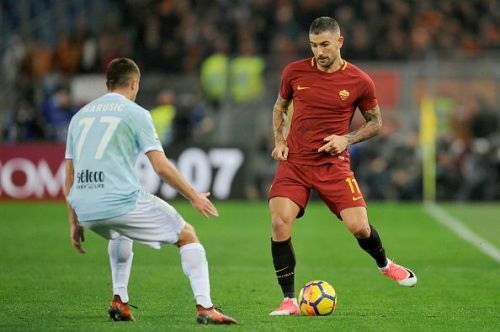 It must be said too, though, that the methods Eusebio Di Francesco has used to ensure Kolarov has an ideal platform to shine have worked wonderfully. To start with, the way Roma's usual left winger and left-sided central midfielder, Diego Perotti and Kevin Strootman respectively, persistently perform rotations in the left half-space has been very fruitful in drawing their markers towards them to free up the flank for Kolarov to burst forward into. Another tactic that has allowed Kolarov to get involved has come courtesy of their usage of the overload-to-isolate principle. In such instances, Roma will initially target the right-hand side of the pitch to attack down, thus consequently shifting the opposition's defensive structure to this overloaded area of the pitch. Then, once they're satisfied that their foes' block has shifted enough, they'll quickly switch the ball to the underloaded left flank, where Kolarov subsequently has oceans of space to take advantage of. From here, he can use his magnificent dribbling skills, superb range of passing and aggressive running power to wreak havoc, while being faced with minimal pressure or an advantageous 1v1 duel. In addition, the way his teammates will often vacate their station so he can either have more room to dribble upfield or embark on damaging underlapping and overlapping movements has only further heightened his menace. His exemplary offensive statistics show his influence; he leads the club for chances created with 2.8 per game, is level for most assists with Edin Dzeko on three, sits second for most successful dribbles pg behind only Diego Perotti on 1.9 pg and ranks second to Dzeko for shots pg with 2.2. With Roma facing a huge second half of the season, you can guarantee their brilliant, set-piece taking specialist will have a huge role to play as Roma strive for silverware both domestically and in Europe.